The market for aerospace composites is projected to reach $42.97 billion by 2022, up from $26.87 billion in 2017, at a CAGR of 9.85% from 2017 to 2022. Clearly, the use of aerospace composites in commercial aircraft has gained momentum during the past few decades, but there is still much room for growth and much more to learn. Lightweighting is generally considered to be the main driver for the increased and pervasive use of composites. However, beyond the contribution toward fuel efficiencies, composites also offer increased resistance against corrosion and part count reduction. Those corrosion characteristics, as well as fatigue properties, lead to lower maintenance costs over aircraft and components manufactured using traditional materials. Commercial aircraft are complex, sophisticated engineering marvels. And while introducing composites into new programs has added many benefits, it has also added complexity. This book aims to help manage and mitigate that complexity. To reduce the learning curve, the book opens with a refresher of key criteria involved with the forming of aerospace components, and then moves on to take a provocative look at the real-world practicality of manufacturing composite parts to rigid, at times untestable, specifications. The book then segues into suggesting a few “rules of design” for manufacturing CFRP components to minimize or avoid common production problems, and then into more specific manufacturing tools and processes that could enable larger and more complex component geometries, while retaining specific material properties and maintaining part functionality. Ultimately, readers will be enlightened to the potentials of aerospace composites, and empowered to include them at the beginning of any aerospace development program, from the smallest component to entire airframes. 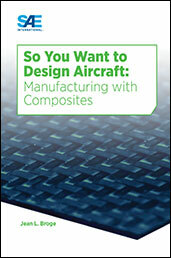 If you do not have access to SAE MOBILUS via username/password or institutional access, you can still purchase the Book, So You Want to Design Aircraft: Manufacturing with Composites.